Ever since my fascination with Star Trek as a wee lad, I've wanted to be on TV. I was just discussing this with my lifelong friend turned Hollywood director, Michael Greenspan. When we were in elementary school, we did a lot of role-playing together and we're convinced it set things in motion for him to end up in film school and me doing my shtick in video production and editing. While I knew my path would never lead me to appear physically on TV as an actor, I had the pleasure of witnessing a logo I designed appear as part of the title sequence for the second season of Rez Rides, a Quebec production that airs weekly on the APTN network. It was quite a thrill! For the second season, the original logo (also designed at Red Dream Studios) was revamped to give it a classic hot rod treatment -- flaming tracer stipes painted over a hard, red glossy body. In fact, two versions of the logo were created -- the first was a pitted, mottled and rusted steel gray version, complete with spot welds, which after a digital painting, sanding, and buffing, transitions into the final version of the logo, the premise being, "bring your rusted crappy car into Mad Mohawk's autobody shop and walk away with a killer set of wheels." The transition effects were created by our partner, Rev13 Films. The first pass of the logo showing Rez Rides in a "before" condition. Creating the logo was actually straightforward. 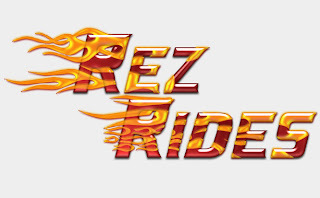 The basis of the logo is the word "Rez Rides" written in the font "NiseHotRod" upon which various textures of flame decals were applied and masked around the letters. The flames themselves are also font-based, letting us easily scale up our design to conform to an HD resolution, the format in which the show is produced. The rest of the look is achieved simply by using Photoshop's own built-in style effects, although to get the proper highlighting and texturing, mutiple copies of the logo layers were assembled and composited using different transfer modes to get the final result. 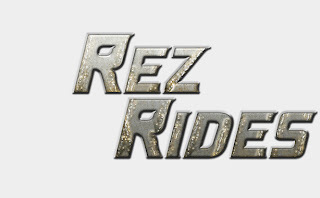 The second pass of the logo showing Rez Rides in an "after" condition. Posted by Unknown at 3:55 p.m.